Lou Dobbs interviewed a veteran Wall Street observer from days gone by, Harvey Eisen, regarding his views on the future direction of stock prices. 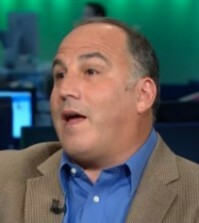 Eisen gained minor fame as a regular on Louis Rukeyser’s Wall Street Week. Its probably been around 20 years since I’ve seen him, but he still looks about the same. 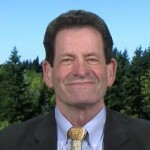 Eisen is currently the Chairman of Bedford Oak Advisors. Dobbs began the interview proclaiming that no one has been calling the direction of the market better than Eisen and asked him to comment on the surprising performance of financials. Eisen questioned why it was surprising. Eisen said when financials were at the bottom there was “all this negative news” and no one wanted to do anything. He said going forward it couldn’t be better for the banks. They’ve been over-regulated, rates are down, and with the yield curve steepening means banks make money. Eisen said the patient was on life support and Ben Bernanke did what he had to do, which is the good news. Eisen said the bad news is that there are consequences. Eisen added, Bernanke could deal with these consequences, admit victory and move on, but he’s got to get Obama elected this year. So Bernanke has to talk about uncertainty and keep “jamming money into the system.” We’re going to pay for this, according to Eisen. Regarding Bernanke, Eisen said “the bottom line is he’s an O.K. guy” and he’s doing what he had to do. After, and if, Obama gets re-elected he’s going to have to raise rates and tighten credit. Regarding the market, Eisen said there have been 10 times in the last 90 years where the market has gone up 30% or more in 6 months. Eisen added that half of those instances were in the Depression so let’s forget those. Since 1975 there have been 5 times when this occurred. Every time this has happened the market has been higher a year later. The interview continued with Eisen commenting on the move of the financials (it’s been enough), the need for markets to consolidate and correct which he sees over the next few months, and his big worry which could occur before the election.